Do you want the proven method to eliminate your bad habits FAST AND FOREVER? 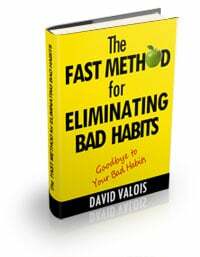 • 5 Fast Methods to eliminate your bad habits. • 3 Infallible Steps to break a bad habit forever! • How even a beginner will change his habits thanks to 5 simple tools. (When I started, I wrote 8 books in a row thanks to this). • The Secret to overcome RELAPSES. • DANGER: Why results of bad habits don´t appear until many years later (when it´s too late). • Why is short term thinking the Kiss-of-Death. • The story of John and Robert: How different habits took one to failure and the other to success. • The 3 Golden Bullets: 3 fast ways to adopt any good habit. • The most effective way to overcome relapses. • 6 Visualization Methods to achieve your targets. • How words will help you to change habits. 2 Steps to create a powerful language. • Your Fortress Of Habits: How to obtain a powerful arsenal of habits. • 8 habits of successful people that will change your life (you will obtain them with only a few minutes a day). Thanks to eliminating my own bad habits, I wrote several books to improve Productivity, Memory and Time Management. And now I give you the TOOLS to also eliminate your bad habits. Forever!